Surfside Shores I and II - Located approx. 1.5 miles west of Hwy. 59 in Gulf Shores. The following information is provided by Steve Warren, RE/MAX of Gulf Shores and Orange Beach, 1 800 686-4005. 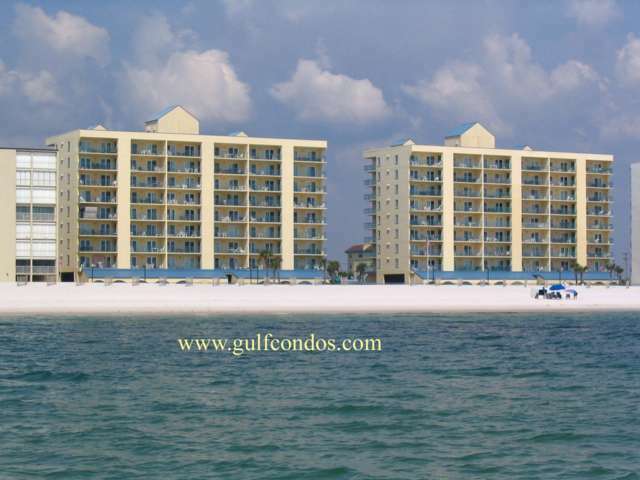 Forget about your other life in one of the area's best Gulf front condominiums. Located only one mile from the public beach, shopping, and restaurants, this complex offers convenience and relaxation. Wake up to a breathtaking sunrise and end each day with a spectacular sunset from your own private balcony. Fully equipped with modern appliances, washer/dryer, cable tv. Nine story with elevator.